Me: Well, actually it seems that lots of Sri Lankans refer to it as tempered rice. Mom: Well, you can just call it fried rice. You’re asking for the blog right? Me: No, it’s tempered rice, I just want to be able to explain how it differs from fried rice. Or where the “tempering” is happening here. Mom: Well…you know…it’s sort of…tempered. This was years ago and I’ve since learned that the whole heating spices and herbs in fat to extract flavour thing that my parents (and other Sri Lankan and Indian cooks) do is also referred to as tempering. Here, that results in the rampe, curry leaves and onion scenting every kernel of rice and that fragrance is a big part of the overall flavour that hits you when you take your first bite. If I didn’t sell you with that, there is one other thing. This rice is fried in butter. 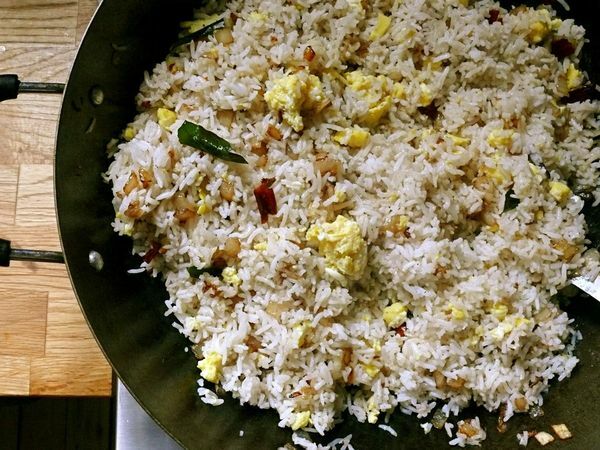 So think of this as Sri Lankan fried rice, butter-fried rice, or, of course, tempered rice. It’s extremely simple to make once you get your hands on rampe and curry leaves, both found at Asian grocers and online too. The chilies might make you think this dish is not one you’d serve kids, but the larger dried red chilies used here are relatively mild and easy to pick around. Mostly they impart flavour, not heat, but you can of course reduce the amount used. I mention kids here because this is a go-to dish for the moms in my family–the kids ask for it by name. And I really want to be around when they ask about where that name comes from. must make: crispy, savoury french toast, preserved lemons and eggplant bacon! Looks delicious! Could I add other vegetables, frozen peas or something, as well? Rice fried in butter. I am so, SO sold. Sri Lanka was colonised by Portuguese. Even a creole language was born from that mix of cultures. In Portuguese “arroz temperado” means “spiced rice”. Perhaps that could be the explanation of that strange “tempered rice”. Yes, that might indeed be it… hmmm. Thanks for the note!